Meeting at 9am at 28 Cloister Road, Heaton Mersey SK4 3AE where you can park up and have a cuppa and a bacon roll before we set of. 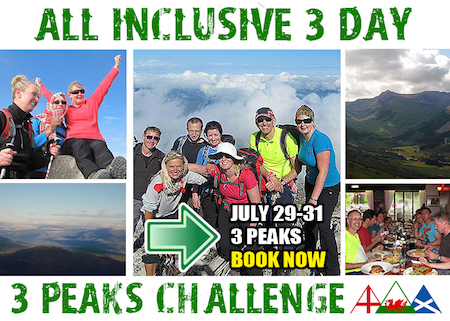 COULD THIS BE YOUR 2016 CHALLENGE, ALL 3 MOUNTAINS IN ONE WEEKEND? Its over an entire weekend NOT 24hr so you dont need to be an athlete! The National 3 Peaks Mountain Challenge is one of the UKs most well known outdoor activity events and attracts many people every year. Climbing the breathtaking Three Peaks is something each of us should do in our lifetime. Meet new people, make new friends, and discover yourself on the greatest peaks of them all. A chance of a lifetime to have fun whilst achieving a truly great milestone. Package includes: 3 days 2 nights All Inclusive, with fully guided walks to the three peaks mountains, transport throughout, all meals, including breakfasts, packed lunches and evening meals in restaurants and certificate of fantastic achievement. Social Circle Price Promise - Find the same deal cheaper and we will double the difference back to you. Climb Ben Nevis (Scotland: 4,400ft); Scafell Pike (England: 3,200 ft); Snowdon (Wales: 3,500ft) in one fantastic weekend. All meals included with dinners, packed lunches and breakfasts, EVERYTHING!! Minibus to stay at YHA in Fort William, with evening meal. Minibus to Lake District and overnight stay at YHA near Scafell Pike, with evening meal. Social Circle Price Promise - Find the same deal cheaper and we will double the difference back to you! Why not do it for a great cause and do it for charity simply choose one that you believe in and get people to sponsor you. For the member's price, you must be a member at the time of the event as well as at the time of booking.